What did I enjoy just this morning? A Summer AdrenaSoothe Latte. 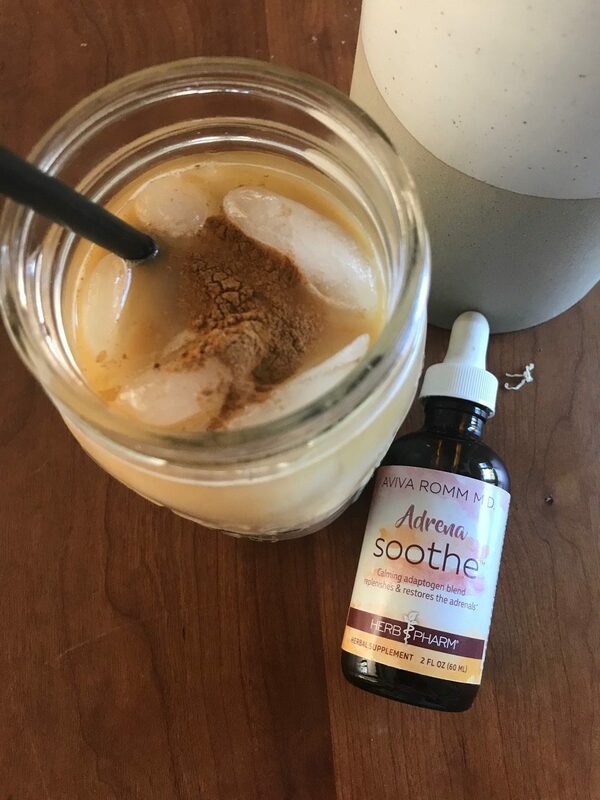 AdrenaSoothe is a calming adaptogen blend that I created – produced by Herb Pharm – to help each of us have more resilience and adaptability to stress, to counteract the effects of an overwhelmed stress response system, and to help us regain the natural balance that supports our overall wellness. This latte is so simple to make and it’s delicious. To anyone who might wonder if this recipe is more of a product placement that is really advertising instead of just sharing a delicious and healthful beverage with you, please visit my Supplements store here. I do not make anything off of sales from that store. After you get your 20% discount, 100% of any commission that comes back to me is donated to my non-profit DharmaMoms to provide salaries and educational opportunities for midwives in resource-poor countries. You can rest assured that my foremost intention is to serve you, not sell to you! Mind and Mood Soothing Tonic: A Goldmine in a Glass!